The Old School, Cropwell Bishop. An informal gathering for parents with babies and toddlers (under 3), to meet play and enjoy the company and support of other parents. 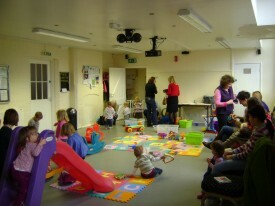 Cropwell Bishop Baby and Toddler Club is almost 3 and we are still growing! What an amazing 3 years we have had in the Cropwell Bishop Baby and Toddler Club, providing company, activities and support for parents and their babies and toddlers. Since we started in March 2009, we have kept on evolving! We have developed from a small number of mums and babies meeting twice a month in the back room of the Old School, to a mixed group of babies, toddlers, parents, and sometimes grandparents, meeting weekly in the large room with a great range of toys and other resources – many of which have been kindly provided by donations and also grants from Councillor Gordon Moore, the Parish Council and Rushcliffe CVS. We listened to what the parents of young children want and consequently we not only meet weekly now, but also make sure that we run sessions throughout the school holidays, when so many other activities for small children stop. We have extended the age group that can attend to 4 years old and we also welcome older siblings in the holidays, as long as they amuse themselves quietly, or better still play with the younger children, who love the extra attention! We have introduced healthy snacks for toddlers and there is always a cup of tea or coffee on hand for parents to enjoy a few minutes of relative peace whilst their children play and make new friends. We organise activities, such as the recent pottery painting session, where all the children were able to decorate a wide range of pottery shapes, which were then professionally glazed and fired and made perfect presents for adoring grandparents! We run a Christmas party each year when the babies and toddlers can enjoy playing together, sharing lunch and then a visit from Santa to round off a wonderful morning. The group is sociable for parents too, providing a chance to chat in a relaxed environment, share ideas, discuss any concerns with other sympathetic parents, and to make new friends. Twice a year we also have a night out for parents to eat and socialise and relax in the company of other parents who know how great it is to sometimes have a child-free night out! As our 3rd anniversary approaches we are evolving again, as from the first Wednesday in February we will be moving to a slightly earlier time of 10-11.30am each week, in response to parents’ suggestions that this would make it easier to get home in good time for lunch. 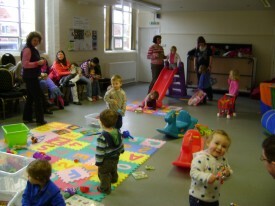 We are also going to hire the back room in the Old School too, so that there will be a separate, quieter, area for small babies and we will be running regular arts and crafts sessions for toddlers. In addition, we hope that our Rushcliffe Community Nursery Nurse will be able to join us monthly to answer parent’s questions on a whole range of child development issues and to provide a confidential listening ear if needed. All this is for the amazing price of £2 per session! So why not come along to a session and join in the fun, everyone with a baby or toddler in Cropwell Bishop or the surrounding villages is very welcome. We look forward to seeing you.